Welcome to the Caffeine WordPress Theme! Download Caffeine 0.2 – The latest version of Caffeine will always be available here. Caffeine Demo Page – Check out an unmodified demo of the current version of Caffeine. WordPress Home – You probably already have this. bsuite Home – Not required but a highly recommended stats package. Welcome to the official homepage of the Caffeine WordPress Theme by Jon Emmons. I developed this theme for use on my own page, www.lifeaftercoffee.com but after hours of work making the code more easily modifiable, trimming the style sheet and simplifying the design I decided to distribute it so others can take advantage of some of my work. 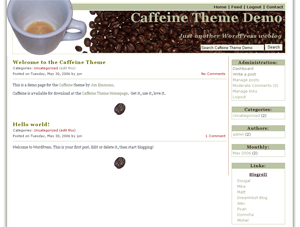 The Caffeine theme is based on the default WordPress theme. I was also inspired by the popular Connections theme by Patricia Muller. What makes Caffeine different? I have spent countless hours removing archaic ‘endif’ statements, cleaning up loops and indenting code for easier readability. bsuite is a great stats plugin for WordPress by Casey Bisson. Since I use bsuite I have included the bsuite calls in the Caffeine theme, but if you’re not using bsuite don’t worry, the stats will only show if bsuite is active. If you are using bsuite, you’ll automatically get your top 10 stories in the sidebar and the story pulse in the footer of single stories. Basically, get caffeine, get bsuite, enjoy. The admin block seen above is something I added for the site administrators. 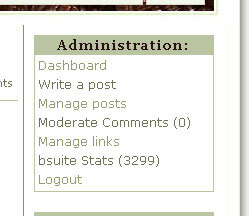 If a user is logged in and has enough privs to edit posts they will see the Administration block in the right sidebar. From there they will have a direct link to the WordPress dashboard, write a post, manage posts, moderate comments, manage links, bsuite quickstats, and logout. The number of comments awaiting moderation and the number of bsuite hits today are also displayed. If the user is viewing a single post there will also be an edit post link. Caffeine is distributed under the Gnu General Public License (GPL). Feel free to take it and use it as you wish. I only ask that if you find something awry please let me know (via email or a comment here) so I can fix it in my theme. It should work with other versions but don’t be too surprised if you run into some issues. If you do have problems, feel free to let me know. Admin and author emails exposed. Work-around: Good spam filtering (thanks gmail). Resizing in IE causes sidebar blocks to misalign. Work-around: Refresh the page and everything is fine. Thanks to Matt and Zach for helping me with my constant stream of questions while developing this theme. Without you guys I’d have never gotten it together. Nice theme, been hacking around with it for a few days, thanks for all your hard work! Any idea how I could make a “subscriber block” like your cool “administration block”? I want to have a block for only registored users to see. Think this might be it? Yes, no? geuss the code in the comment box is not working, sorry fo the many posts. That sounds right. Fair warning though, I think the current_user_can function is a WordPress internal function. Just watch out for it when you upgrade. Glad you’re enjoying the theme. It was lots of fun to write. Glad you like it Dave! You’ve got a nice site and a great domain name! I just have one tiny nitpick. When viewing the monthly archives, the sidebar doesn’t align correctly. Any idea how to fix this? I thought maybe it was just a result of my customization of the theme, but it also happens in your demo. Go to the demo, click on the May 2006 archive link in the sidebar. The “currently browsing” block is fine, but everything below that in the sidebar shifts to the left over the border. I fixed the monthly bug that Dac mentioned. If anyone wants the fix and can’t wait until 0.3 just drop me a comment. if you could mail me the fix i’d appreciate it. i”m sure it has to do with the stupidity of i.e. I have to admit that I started modifying the theme for use only on my own site but after I spent so much time cleaning it up I figured why not share it? Glad you like it. You did a nice job modifying it too! Thanks putting the time into this theme. As someone that is more user than hacker, I appreciate that the theme is clearly structured . . . it makes it easy for guys like me to see and understand how themes work. Thanks for the great feedback Pat! I hope to make even more improvements with Caffeine v0.3, now I just need to find the time to work on it! Hi, I loved this theme of yours and tried it on mine but I ran into a couple of problems. I am not m uch of a computer geek so don’t quite understand whats wrong. 3. as the page begins, its all fine….. halfway through the posts start getting distorted!!!! Can you help me with this???? I think the smiley thing has to do with how images are handled in the style sheet. You might look in your old theme’s style sheet for something which defines image.wp-smiley (it may not appear exactly like that) and paste that into the styles.css for the caffeine theme. In Firefox the header looks fine. What browser are you using? after the image and the story will extend to include the entire image. I may automate that in the next revision but that’s still a couple months away. I love the caffeine theme!!! I am very new at this so my question about the theme could be, well, stupid. Here it goes: I would like to create a static home page with a mini loop so that there is consistant content (like welcome stuff) at the top and the first couple of blog entries at the bottom. Is that doable? If so, can you tell me how? I think ita’s comment basically is asking about the same things. Could you help me out? Thanks! I purchased your Oracle Shell Scripting book awhile back and, in fact, I wrote your first review on Amazon.com. Unfortunately, I somehow lost the website link to your code depot. Although I have the username/password, I don’t know where to get the actual code. Could you please provide this info for me? I would really appreciate it! Thank you in advance. I recently purched your book, oracle shell scripting, and I have the username and password in your book, but no web site. There are several of your scripts I would like to download from chapter 12. Any chance I can get the scripts in soft-copy from your book from you? Hi bought your book Oracle Shell Scripting. Can’t recommend it highly enough – very good book just what I was looking for. Could you please email me the url for the code depot. I recently purched your book, oracle shell scripting, and I have the username and password in your book, but no web site.